No, you're not hallucinating. The "cream cheese" part is correct! 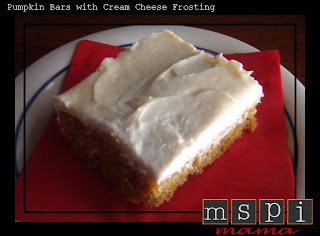 I was so excited when MSPI Mama reader Katie shared with me that Pillsbury's cream cheese frosting is MSPI-friendly! That's just fantastic for those of us who adore carrot cake and other desserts that are best topped with that type of frosting! Thanks, Katie! I really wish I could have posted this recipe before Thanksgiving, but that unfortunately didn't happen. Sorry! The kids really enjoyed eating this after all that turkey and mashed potatoes! I slightly adapted a Paula Deen recipe. The only change is using the Pillsbury frosting and baking it in a jelly roll pan, instead of a cake pan. Using an electric mixer at medium speed, combine the eggs, sugar, oil and pumpkin until light and fluffy. Stir together the flour, baking powder, cinnamon, salt and baking soda. Add the dry ingredients to the pumpkin mixture and mix at low speed until thoroughly combined and the batter is smooth. Spread the batter into a greased jelly roll baking pan. Bake for 30 minutes or until done. Let cool completely before frosting. Cut into bars. As you already know, it isn't always easy to find bread that's safe for you or your child to eat. Don't despair, make your own! My favorite go-to bread recipe when I'm in a hurry is the No-Knead Wheat Bread, made with whole wheat flour and bread flour. It's extremely easy! When we're eating soup, I like to make the following recipe, which I adapted slightly from AllRecipes. It does require a little more work than the No-Knead method, but in the world of bread making, it's still relatively easy. And delicious! In a small bowl, dissolve sugar and yeast in warm water. Let stand until creamy, about 10 minutes. In a large bowl, combine the yeast mixture with flour; stir well to combine. Stir in additional water, 1 tablespoon at a time, until all of the flour is absorbed. When the dough has pulled together, turn it out onto a lightly floured surface and knead briefly for about 1 minute. Lightly oil a large bowl, place the dough in the bowl and turn to coat with oil. Cover with a damp cloth and let rise in a warm place until doubled in volume, about 30 minutes. Deflate the dough and turn it out onto a lightly floured surface; knead briefly. Pat or roll the dough into a sheet and place on a lightly greased baking sheet. If you like, lightly poke all over the dough with your fingertips or the end of a wooden spoon to create divots. Brush the dough with oil and sprinkle with salt and herbs. 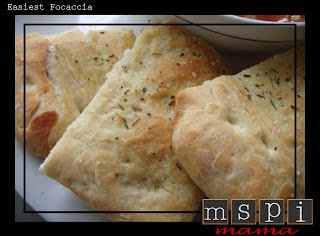 Bake focaccia in preheated oven for 10 to 20 minutes, depending on desired crispness. If you like it moist and fluffy, then you'll have to wait just about 10 minutes. If you like it crunchier and darker on the outside, you may have to wait 20 minutes. Tip: Because my home is often cool (Especially in winter. Gotta save a few bucks on the heat!) I will warm my oven slightly for a few minutes, then turn it off. This is the perfect "warm place" for dough to rise in. Just make sure you remove the dough from the oven prior to preheating!